Iraqi-born artist Wafaa Bilal’s new project 168:01 is one of the most poetic, political, and useful artworks of the last decade. Through the project he highlights and acknowledges the destruction of the cultural history of Iraq while enacting a process to rebuild it and move forward despite. In the past few years, due to the constantly expanding nature of U.S. military actions, IVAW has transitioned from focusing on the individual wars to a more strategic approach to the work. We focus on the root cause that underlines both the occupations by U.S. military abroad and the violence perpetrated in our communities by police right here at home: militarism. 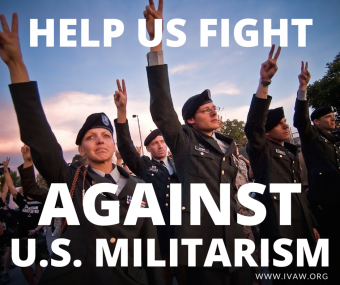 IVAW’s mission is to build a service member and veteran led movement that ends militarism by transforming ourselves, military culture, and American society. Drop the MIC is focused on interrupting the relationships between profit, institutional violence and politicians.